PUMPKIN SEASON! How much I love you! I made some pumpkin donuts yesterday. 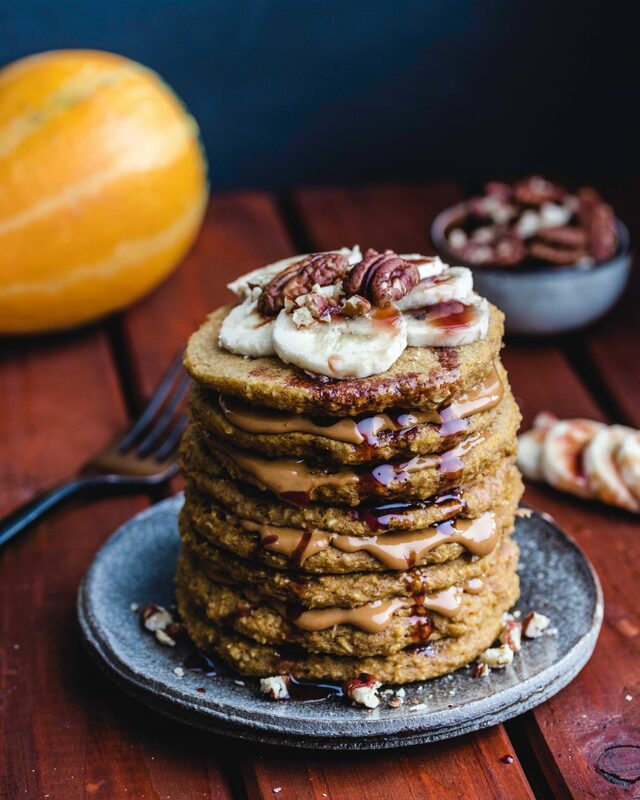 The day before these pumpkin pancakes. What will I make with pumpkin today? I love love pancakes for breakfast, well who doesn´t? Before going vegan I hardly ever ate pancakes. But these days I crave them at least once a week. They do take a bit longer to make than porridge but making pancakes feels so festive, like you are on holiday. I like that. Adding pumpkin to them makes them even better! I actually adapted a very old recipe of my mine. I love the result. 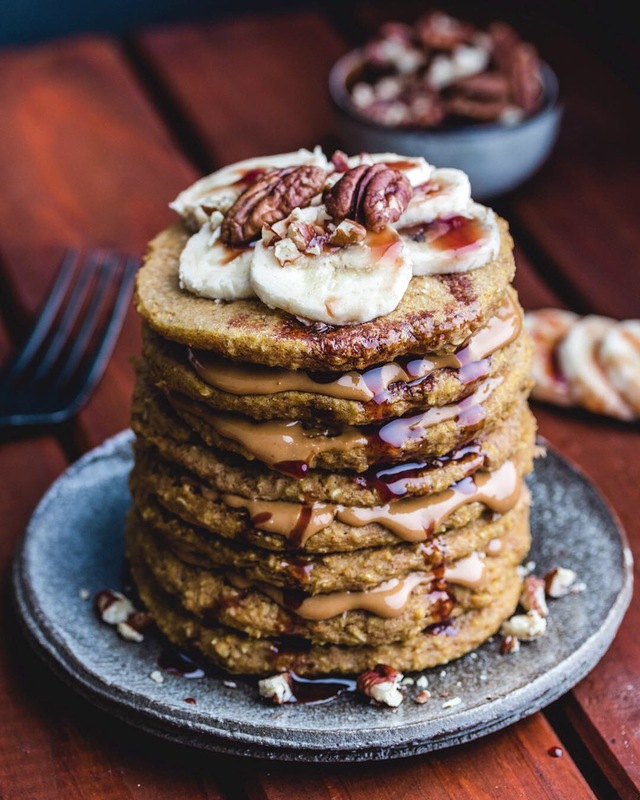 Thick but fluffy pancakes layered with peanut butter! Yes, peanut butter! Gimme all those calories! Check out my Fluffy Pancake Recipe as well! I hope you will enjoy these babies as much as Philipp and I did! I can´t wait to make them again! 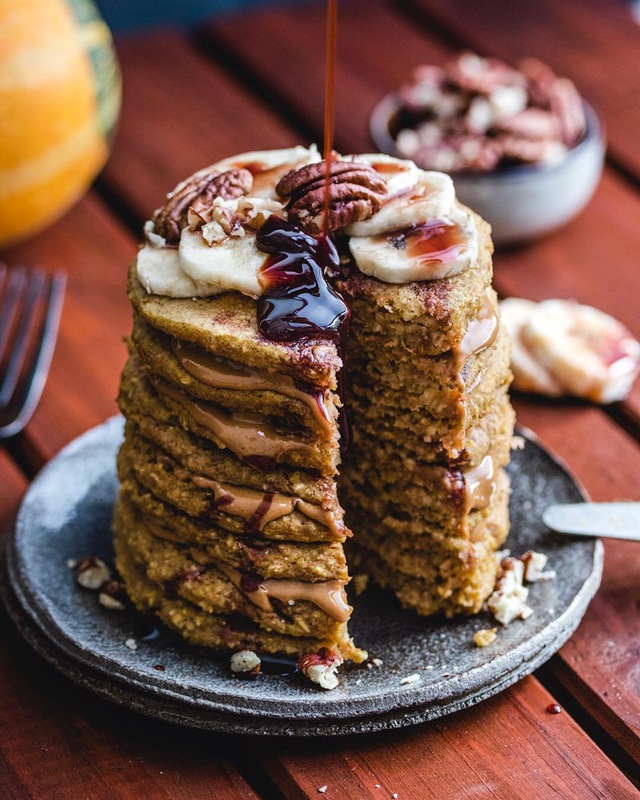 Make the most of the pumpkin season and try these delicious pancakes! Mix your dry ingredients in a bigger bowl. Add the cooked pumpkin, the vanilla, the plant-based milk and the apple sauce to a food processor or blender and mix until smooth. Add this mixture to your dry ingredients. Scrape out your food processor or blender with a spatula and mix everything well. Heat a non-stick frying pan on low heat and add one spoonful of batter in the pan. Using the spoon even the pancakes a bit. I can fit up to 4 small pancakes in my pan. Cook until you can see some bubbles, then flip them over and cook until golden brown. Serve with peanut butter, date syrup, bananas and chopped pecans. You can also use maple syrup or anything you like! *you can also use rice flour to make them gluten-free. Check out Hummusapien´s blog post about all her pumpkin recipes!